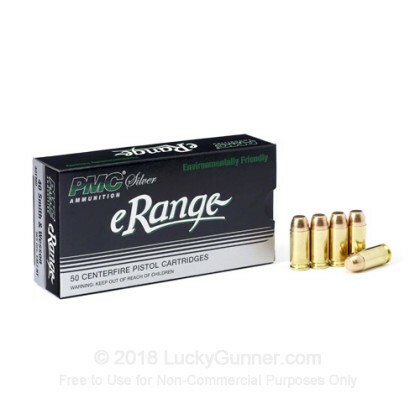 PMC eRange Ammunition provides highly reliable and accurate PMC practice rounds, in a non-toxic and environmentally friendly form. eRange Rounds are manufactured with cleaner burning, heavy metal free primers and non-toxic enclosed metal jacket bullets. This combination makes them ideal for practice shooting in enclosed spaces, where ventilation is limited. PMC has earned an impressive reputation in the U.S. civilian market over the last few years due to its dependability round after round. This ammo is new production, boxer-primed, brass-cased, non-corrosive, and reloadable. 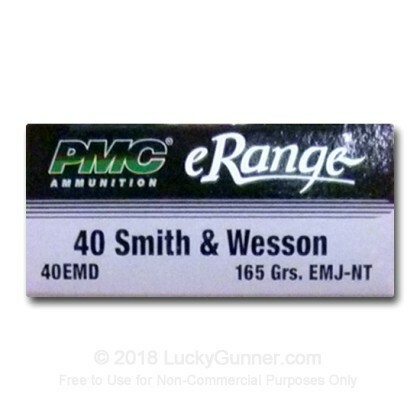 We don't have any reviews yet for this particular .40 S&W (Smith & Wesson) ammo from PMC. If you'd like to be the first to review this particular .40 S&W (Smith & Wesson) ammo from PMC, fill out the form below.